Oregon Museum of Science and Industry denial backfires – big crowd in Portland hears all about climate change skepticism | Watts Up With That? More than 400 people jammed into a Portland hotel ballroom Wednesday night to hear a panel of global warming skeptics assert that manmade increases in greenhouse gases are not driving climate change. The event, hosted by the 150-member Oregon chapter of the American Meteorological Society, was open to the general public and drew an attentive and mostly sympathetic audience. Chapter President Steve Pierce asked for a show of hands beforehand, then estimated that 90 percent of the crowd favored the statement that human activities are not the main cause of global warming. Three Oregon-based panelists — physicist Gordon Fulks, meteorologist Chuck Wiese and former Oregon state climatologist George Taylor — used long- and short-term temperature measurements and other data to bolster their case. Skepticism about climate models was prominent, particularly given a general flattening of temperatures since 1998, a relatively warm El Nino year. Water vapor, sun cycles and natural weather patterns are more powerful in changing climate than increases in carbon dioxide from burning fossil fuels, the panelists said. “The effects of future changes in CO2 are likely to be modest and manageable,” said Taylor, who added that Northwest records do not indicate that temperatures have risen or snowpack has fallen, subjects of substantial debate. The Oregon AMS moved the presentation to the Portland Airport Shilo Inn after the Oregon Museum of Science and Industry canceled it in November for lack of balance, and the ensuing controversy likely boosted in interest in the event. My family is originally from Oregon. I went to college there and travel to Portland twice or more each year. Environmentalists have has convinced many Oregonians that their future depends on marketing their community to the world as “hip” and “green”. Virtually all institutions in state, including OMSI embrace this view. I pity Oregonians. Their taxes are high and their economic growth is stagnant. That said, Mr. Taylor and company deserve strong support. Looks like they are opening a few eyes. Environmentalists have has convinced many Oregonians that their future depends on marketing their community to the world as “hip” and “green”. It isn’t as bad as you think. That attitude is limited to about 10 counties. I think as they experience being ripped off enough times, their attitudes will change. That will happen even faster if climate cools off. If you remove the area around Eugene and Portland, Oregon is actually surprisingly conservative. AGW Theory loses everywhere it is debated. That’s why pro-AGW folks refuse to debate. I attended a meeting recently about how to inspire change in individuals and in companies. One of the women there was a writer who attended a climate skeptics conference to see what the issues were. It appears that nobody at the conference denied the impact of human activities on climate. What they appeared to be taking issue with was the fact that this news may change the way they live which is frightening for those who are change adverse (across all party lines). I am not sure what the tone of this conference was but it is something to keep in mind that 99.9% of all scientists agree that human activities have impacted the climate. This conference may have simply been hiding another issue all together under the guise of anti-climate change. I sent Steve Pierce an email asking that he makes the video available. They usually tape their events, so I am guessing there will be video. It’s going to take a few more of these types of gatherings to get the word out there to the general public. The suggested format would be: Try to book a place that would refuse. Get the publicity in the local newspaper. Book another place, and expect a larger crowd. I just saw this from Steve Pierce, as quoted in the Columbian Newspaper. Crosspatch is correct as to the ten counties. But the problem is that most of the population lives in those counties. greenurbangirl, I think you may find your figure of “99.9% of all scientists agree that human activities have impacted the climate” is a little high. Strictly speaking, probably 100% of scientists believe that human activities have had climatic impact. And I’d even guess that 100% of readers and supporters of Watt’s Up With That agree “that human activities have impacted the climate.” I certainly agree with it. In fact, I’ve been reading this blog for over three years and never have I come across a single suggestion that human activity does not have climate impact. In fact, one of Anthony’s main themes has been to demonstrate that local climates in urban areas (where the vast majority of temperature recording stations are located) have warmed dramatically as a result of local man-made conditions. Oddly enough, many of those who disagree most vehemently with Anthony have attempted to deny or minimize this dramatic localized warming. So the issue is not whether human beings have caused climatic changes or will continue to do so in the future. The core issue centers around claims that these man-made changes 1) are globally significant and measurable, and/or discernible from ever-present background climate change not caused by humans; 2) pose dangerous large-scale risk to human beings and to ecological systems; 3) are subject to prevention or reduction by either national or global efforts to reduce CO2 emissions. There are many scientists who would answer “yes” to some or all of these questions, and many who would answer “no” to some or all of them. I appreciate this forum–despite its weaknesses–as a place where interested persons from a wide array of backgrounds can learn and question and offer their perspectives. greenurbangirl, I hope you stick around. Thanks for the post. So let me see. You were at some meeting where some lady said she was at a different meeting where she perceived that it seemed most people believed AGW but were adverse to change. Now that is believable! You must be new here. You may not realize but that whole “99.9% of scientists” comment has been thoroughly trashed years ago. No one who studies the facts believes that still. Straw man argument alert. Skeptics generally accept that mankind has some influence on climate through aerosol emissions, agriculture, urbanization and even emissions of so called greenhouse gases. So in that way skeptics agree with your alleged 99.9% of all scientists. What skeptics are skeptical of is the claimed sensitivity to doubling of CO2 concentration and the seeming irrational fixation on hypothetical bad effects from CO2 concentration increase to the exclusion of positive effects of an increase in CO2. So your post reveals that you really did not learn how to “inspire change in individuals” at this meeting, at least not in knowledgeable individuals who have been observing the global warming/climate change/ climate disruption circus for a while. Please show us or direct us to the poll for the basis of your 99.9% figure cited. While I agree that humans have had impacts (and speaking as a Civil Engineer, I know we’ve certainly made changes to the landscape), what I suggest we do not know clearly is if those impacts are (1) “significant,” (2) irreversible, or (3) overwhelming the natural systems. Take for example the item that follows this on WUWT’s main page regarding projections for the magnitude (and start date) of Solar Cycle 25. NASA scientists acknowledge that “we don’t understand” the links between variations of the sun’s cycles and Earth’s climate, but yet asserts that a practically flat Solar Cycle unlike anything we have seen in 300 years or so — three centuries — will not result in anything close to a Maunder-type Minimum. The impression I walked away with was that despite the fact that SC 25 will probably not peak until 2030 or so, and the peak will be almost nonexistent we have nothing to fear and the world will still continue to warm. Natural forces are nothing to trifled with: there have been numerous dams, bridges, buildings and levees built that were monuments to humankind’s stupidity and arrogance, structures that failed because we did not account for the uncertainties in the [incomplete] data we had on natural systems and the fact that historical records have a beginning before which we generally have nothing on which to base our theories, leaving only conjecture and supposition. I am not sure what the tone of this conference was but it is something to keep in mind that 99.9% of all scientists agree that human activities have impacted the climate. I couldn’t agree with you more greenurbangirl, we humans have impacted the climate; and that is irrefutable. Well Heisenberg explained to us nearly a hundred years ago that simply looking at the climate, will change it, and in ways that we can’t predict, and with our luck, they are most likely to be bad. So all of those green Oregonians rushing around out in the wilderness, are changing the wilderness, just by being there. So perhaps you can explain to us, just why you are greenurbangirl, and not greenruralgirl. It seems that you might be part of the problem. A niece of mine just moved up there to provide a better life for her daughter, than her parents provided all her life for her here in California. If I told you what my niece’s husband does for a living, that enabled them to leave the sorry state of California for your green paradise; you would simply be horrified. Talk about a total and complete waste of precious and valuable resources; with absolutely no redeeming social value whatsoever; that’s what he does, and he is very good and successful at it. My son is studying in school to do exactly the same thing as his cousin’s husband does. @greenurbangirl: As the famous quote goes, “Where you stand is where you sit.” If you are in an urban location, the local climate has certainly been modified and modified to the warmer. You do not dump all that energy in a small area and not expect the temperature to go up. On larger scales, man made effects can take the Aral Sea and turn it into a desert. But I really think the question is one of broad impact on the order of the “Little Ice Age” or the “Medieval Warming Period”. Here I suspect you will find that many scientists, meteorologists and assorted PhDs in the field (such as myself) do not feel that man made effects are either permanent or noticeable on a mesoscale. New York City had a different local climate when I was growing up in the 1950s from where I lived 10 miles away. That difference was man made. But aside from such relatively small and potentially transient effects, I doubt that man has more influence than other factors that determine climate on a mesoscale. Sorry. greenurbangirl, welcome to WUWT! Diverse opinions are always welcome but be aware that many commenters here demand hard science and will jump on anything less. Enjoy the wealth of information available! What human activities are impacting the environment? How much impact? A little, some or a lot? And impacting how? Does any of that mean AGW is real? Is evidence of climate change evidence of a human cause? As usual, The Oregonian underestimated the crowd. I was there – it was about 525 attendees. The president of Oregon Chapter of AMS asked right at the beginning for a show of hands from the crowd of who believed climate change was not human caused, and over 90% of the crowd raised their hands. Welcome to the forum. Please ignore some of the vitriol you may receive from some of the commenters as some have been viciously attacked on other sites for their “heretical” views. I think you will find most commenters and posters to be quite engaging. I would warn you that if you wish to present some statistics or scientific discourse you need to be sure you can back it up with references. Otherwise you are likely to get flamed. Again, welcome to the fray and I hope you stick around! You see, what we are really up against is a) the misrepresentation of the sceptic viewpoint and b) the fact that there isn’t a single sceptic narrative. I think that you will find that “everyone” believes that man-made activity has some effect on the weather/climate. It must do – the UHI phenomenon is evidence enough of that – anyone who has lived in London knows that it has a different climate to the rest of the country. Deforestation, pollution, urbanisation, intensive agriculture all have their effects on the ambient conditions. As most sceptics are fair-minded people, if you were to pose the question “Do humans have an effect on the climate ?”, I suspect that nearly 100% will say “Yes”. And that is where (b) comes into play: some sceptics will state that the obsession with CO2 is the problem, some will say that it is computer modelling that is at fault, some will say that the numbers and arguments are simply made-up, others will take a political stance and claim that Global Warming/Climate Change is simply the hard-left finding something to campaign with because Marxism is dead. Climate change scepticism will never really influence policy, because it does not have a united voice, it attacks the enemy on many different fronts, but in small partisan brigades. WUWT is an excellent generalist site that covers everything, but many other sites are single-issue/specialists who cover other issues beyond their iommediate scope poorly or sparsely. There is no sceptical organisation with the lobbying and PR clout that Greenpeace has. Because many in the media are of the same left-liberal mentality, they are prepared to allow such organisations free rein with their views and make wholly false statements without challenge ( I saw just this yesterday on Austrian TV: the local petrogas firm OMV are going to start “clean-fracking” just up the road from me, but Greenpeace are determined to stop it, because it will “ruin the ground-water” and produce “dirty gas”. Nothing on the news about the local resistance to a giant windfarm that is going through the courts, though ). This OMSI episode is the entire argument in microcosm – scepticism threatens the AGW industry and has to be stamped out. Unfortunately what many on both sides of the fence forget is that economic reality trumps everything ( Marxism again ) and the state of the economy or security of supply will really decide our future. Solar farms and windfarms, for instance, become very unattractive without subsidies in these straitened times and before anyone says that nuclear needs subsidies too, they are right. But a nuclear plant has a ROI of 20 years, after that they create megabucks in profits – which is why the German electric companies are so annoyed at Merkel, their plants are going to be shutdown at their most profitable points, but after 20 years a windfarm has fallen to pieces. I see that a climate scientist present – Andreas Schmittner, a researcher at Oregon State University – was described as ‘the lone dissenter’. It must be weird sensation for a climate scientist to be labelled thus!!!! Heisenberg did nothing of the sort. His uncertainty principle relates to events that happen on an atomic scale. I would estimate 100 % of the scientists believe mankind affects climate. I certainly do as do Lindzen and Choi etc. I believe AGW is a fact but mild and beneficial so far. I do not believe CAGW exists or ever will exist. The skeptics positions are constantly misrepresented. We know there are serious issues with the science of the warmists, issues that climate realists spend a long time exposing and debating. But realists are getting drawn into a scientific discourse of nuance and minutiae that turns off the casual observer. It’s playing into the warmists’ hands. For many people it is all too confusing and frankly they find the subject remote and boring. Isn’t it better to focus on what is directly relevant to them in order to get them on side? It is the cost of climate change policies, carbon taxes and trading, things such as air passenger duty, and taxpayer funded subsidy for unreliable energy generation that drive up electricity bills that make people sit up, take notice and see the warmist agenda for what it really is – something that has nothing to do with science. Oh great. One lame strawman comment from am obvious troll and 90-odd per cent of responses are pitched to her/him/it – when the troll will probably never return to this thread. Yawn. Andreas Schmittner appears to be a bit of a lukewarmer according to this article. We all hear what we want to hear. I hear a polite young lady who wants to make a difference and is willing to believe things she is told. She comes here and is welcomed, scolded, and put down all in the same thread. So I will add my comments, and hopefully in a nice way. We all agree that humankind has an effect on the environment. I live in the suburbs of Phoenix AZ. I used to drive through pecan groves and cotton fields on the way to work. My house was 5-6C cooler than downtown. Now 20 years later everything is paved over with asphalt and concrete and houses are everywhere. The temperature at my house is the same as in downtown Phoenix. So yes, we humans have had an impact on the environment – especially at the local level. What comes next are the questions: Is this bad? Is the current climate trend unprecedented in human history (think MWP and LIA)? Is manmade CO2 release going to cause catastrophic changes to the environment? Is is going to cause any change at all? Can we even know what this change is? Is this change worth decimating the world economy in an attempt to reverse? How about turning our rights and liberties over to government authorites so we can be saved (I’m from the Government and I’m here to help)? Do we have a bigger impact on our planet than the oceans? vocanoes? clouds? the jetstream? the sun? We know that 13,000 years ago the earth began to warm and we came out of the last great ice age. Human caused or a natural variation in the earth’s climate? Is the warming of the last 30 years (if any) really a more unprecedented change than hundreds of miles of glacier recession? And why doesn’t that apply to the macro scale? Case in point is the question that stumped Einstein in his later years — If a tree falls in the forest and your wife is not there to blame you, is it still your fault? Some people need a sense of humour transplant! Regarding greenurbangirl, CAGW activists have long tried to portray skeptics as paid shills for the fossil fuel industry. But this line of attack failed because it was easy enough to demonstrate that it was not true. So the new line of attack is to portray skeptics as suffers of a debilitating mental illness that make us intensely fearful of change and as such, incapable of accepting the CAGW hypothesis. Using this line of attack, the CAGW activist can appear more sympathetic (certainly more sympathetic than Michael Mann and his conspiracy theories) and can enlist others to help us poor suffers through the “difficult process of change”. Oh brother. GreenUrbanGirl, is that green as in naive or green as in jealous? It can’t be green as in plants because plants love CO2, like we love oxygen. The Man-Made Global Warming scam becomes evident when one looks at the narrative that spews from the alarmists. Only evil and suffering can come from a warmer Earth. “Congratulations children, The Energy sources that fuel our economies and our prosperity, give us long life and comfort, these fossil fuels will also cause our planet to warm gently, about 4 degrees over the next century. What luck! If all the CO2 hype were true, This COULD be what the “experts” would say. Ask yourself why this is NEVER what they say. Greenurbangirl, welcome to the fray, from an aging science tech across the Pond. You’ve probably already noticed ( 😀 ) that any unwary mention of a percentage, or other claim, will get pounced on instantly with requests for a reference – a fact that stops about half my comments dead in their tracks, as the chaos inside my computer is almost as great as the chaos outside it. Keep off one or two banned topics like … Kem Trayls (ha haar, the mods will never spot that one! ), and our genial host will remain genial as we squabble among ourselves over details, agreeing only that the science is anything but settled. Only obsessively non-climate posts and downright rudeness result in the Order of the Boot; mostly, we’re quite friendly, and even green, ourselves, it’s why most of us come here to learn. Enjoy. Sceptics are winning, but I doubt there will ever be a large, decisive victory for us to look forward to. This world simply doesn’t work that way. Look forward to that video though. Did they happen to mention that 9 out of the 10 warmest years on instrument temperature record have occurred since that time? Probably not. Since when do so-called “skeptics” make such a definitive assertion? I thought they were supposed to be “skeptical” about the causes of climate change. Seems their neutrality would be called into question in this instance, such that they ought not call themselves skeptics as they seem to have the climate all figured out. Well Roy, that definitive statement could win you a Nobel prize in Physics. Who would have guessed that delta x.delta p > h/2 pi does not apply to larger than atomic scale. So tell us Roy, just what macroscale, as in larger than atomic scale system do YOU know of, wherein you can prove that delta x.delta p; or alternatively delta E.delta t can simultaneously be measured to less than h/2pi precision ? Every Physicist I have ever asked about Heisenberg’s principle has insisted emphatically that there are no cases at any scale that violate its restriction. So you may know of the first case that sends Heisenberg to the scrap heap of failed theories of Physics. “unbestimmtheit” or something close to that I think is how he put it. Werner was nobody’s dummy, and frankly; I’ll take his word before yours. It applies from atomic to galactic cluster scale as far as I am concerned. I don’t joke about such fundamental things. What part of “flattening” do you not understand? Given things from Joe D’Aleo’s latest post here and the Chinese tree ring study, I’m happy to concede that “plateaued” would have been a better choice. What is funny is that you dont mind feigning ignorance of the concept of “flattening” to make a nonsensical non sequitur. R Gates, have you never looked at a graph? Apparently you have no concept of an ascent flattening – even when it supposed to be accelerating alarmingly. Your second point slightly better connects with reality. GHG may be driving climate change but the debate is how significantly. However the quote from the presenters “The effects of future changes in CO2 are likely to be modest and manageable” expresses that moderately and well – and calls into question your own neutrality. …they ought not call themselves skeptics as they seem to have the climate all figured out. I was going to use something along the lines of monitoring a 288VDC signal with multiple sine wave noise. The base frequency being 25Hz and the time frame being 20ms. 9 of the last 10 100µs samples were the highest in the sample range, therefore, the voltage is going up! Am I the only one Dave, or are you also amazed, about how many people are willing to go and jump off cliffs over something they know nothing about. And we see in just a few posts, that they can demonstrate they know nothing about it, in several different ways. One of my all time favorite cartoons, depicts a couple of precave men standing at the top of a sheer precipice, about to perform a memorable experiment. Well it will be memorable for one of them. Out away from the cliff edge soar a pair of Pterodactyls riding on a thermal. The theoretical physicist one of these two government grant money spenders, has often admired the Pterodactyl with it’s great long tooth encrusted beak, and its equally long and pointy rearward brain cavity, so he has constructed from bark, and leaves, and no doubt dinosaur skins, a realistic likeness of the two streamlined appendages, and a harness for strapping them on to his head, so if he ducks down, he might just entice one of those soaring pre-birds to come and check him out; perhaps with matrimony in mind; but there he stands at the edge of the precipice, with arms stretched out in front of him, about to do a half gainer off the cliff. ” Say Oog , are you sure that pointy nose and head is what makes them fly ? !! I hate to even mention this; but the query, about flushing the toilet twice in San Franciso, messing up next week’s surfing contest in Hawaii; or the more common butterfly version, are related to CHAOS theory, and don’t have a thing to do with Heisenberg’s principle of uncertainty. Sorry George but I’m not really up on Heisenberg’s principle of uncertainty. If you set up to observe a wave, a wave is what you see, if you set up to observe a particle, a particle is what you see. At larger scales, I just don’t know. Above all, we need to thank the Oregon chapter of AMS for pointedly demonstrating that meteorologists are in contact with reality! This is true in many trade groups and organizations nowadays…. most members are sane, and most local branches are sane, but the national level of the organization is utterly wacko, following all the idiotic fashions of the hard left. 288VDC? That’s a lot of PV panels to wire in series. Are you modeling kelvins with volts 1::1? Locally yes, globally though I will disagree. Most people do not recognize how vast this planet is from the human perspective. If we stood all of humanity up each in a square meter of space we would all almost fit in the Everglades National Park in Florida – do the math – I did. A miniscule area of the planet. And that is in a two dimensional scale. The planet is very 3-dimensional as well. In cubic meters we would amount to a bunch of ants on a few trees in a forest somewhere. There’s a guy on the beach (bottom right). Looks like an ant, and this is just a LOCAL image. How many copies of him could you fit in just that picture? The planet is huge. Gives you some perspective….. So we think we put out a lot of waste, CO2, etc. Locally, yes. In the context of the whole planet, we don’t even come close. We are so self important, so “we are it”, in every which way. It’s kind of a sickness. WE are ALL so self important, while int e the big scheme of things we’re really just a passing evolutionary fad. Get used to it, make your family safe, and make the most of what you’ve got. The rest is just hyperbole. It’s not really that weak a point. We really don’t know if there are underlying cycles we don’t know about. I choose (d) All Of The Above. As below, so above. Lorenz later went on to demonstrate that you never get to round your input data, much less truncate. Only infinite accuracy will do in a chaotic system. So even atomic uncertainty propagates, sometimes, unpredictably, to macro events. Al Gore told the world it was settled, unless they would buy his carbon (guilt) credits. The world told Al, to take a f***king flying leap, and here we are. Watching the sand castles disintegrate. water pollution, air pollution, UHI, land use changes, plastic waste in the Oceans, etc. etc. etc. These detrimental effects do tend to be localized since the Earth is still a pretty BIG place and pristine (or very nearly so) places do still exist. Yes, some human effects travel vast distances. However, we have made GREAT progress (at least in the more developed areas of the world) in the last few decades. Sewage treatment plants, banning phosphates in detergents, air pollution technology on power plants, etc. etc. These technologies have made a huge difference, I see it right here on the shores of the Great Lakes in the USA. All of this progress was well worth the cost and indeed being careful with what we do with our waste products makes a HUGE difference that benefits everybody. Now, we need to discuss the topic of “climate”, my definition is; “climate is what you expect, weather is what you get”. I consider climate to be just one variable that can be observed in the environment. I have yet to see any, I REPEAT ANY, proof that any of our activities are changing the climate. The main hypothesis that humans are changing the climate, i.e. the Greenhouse Gas Hypothesis is WRONG. I won’t detail that here since folks that believe it is probably wouldn’t take the time to read any other hypotheses anyway. I believe that the “GHE” only changes the response time of the gases in the atmosphere to changes in the energy arriving at the surface, i.e. sunrise, sunset, accumulation of clouds, dissipation of clouds. It does not cause a “higher equilibrium temperature”. So put me down for 98% of the menu, but I will pass on that LEMON known as the Greenhouse Effect. Oh, I would also like my DDT back, I do hate those mosquito bites. And why is it my parents never warned me about bedbugs back when the Cuyahoga River was burning ? The problem with Heisenberg at the macro scale is I really can’t measure the difference between a momentum and position of an object of say 1000 kg m/sec(p) * 1000km(x) and 1000 kg m/sec(p) * 1000km(x) +hbar. My measuring equipment can either measure really small things precisely or really big things with error bars much larger than the quantum step. So in practice, it is really difficult to observe the uncertainty at the macro scale even if it does still exist, as hbar is so small as to appear continuous on the macro scale. That’s another way of saying that the “temperature has reached a plateau”…at least when you add that its divergence from the model predictions is rapidly becoming embarrassing. On the rest of your points: come on! It’s a news article. What do you expect from a journalist? R Gates, I must ask… Since when does a reporter’s hyped description qualify as the definitive moral characterization of the “skeptic movement ? I would caution you about counting those sand castles before they fully disintegrate. Some one please explain how mankind can influence either the winter temperatures, or climate of Fargo, ND when the jetstream is visiting Corpus Christi? UHI effect? Wrong. Any measurement of any system effects the system being measured. Sorry, I don’t follow. Please explain how a weather station recording temperatures affects the system being measured. I was there the entire evening. It was quite good. All three speakers gave good presentations using the establishment’s own data, modeling, claims and theories up against broader data sets and observations that do not the fit the AGW tall tales. It’s quite easy for most people to recognize the many contradictions before their eyes. Too bad R Gates wasn’t there he could actually comment on something that was said. Of course R Gates just wanted other stuff said. There was however a guy like him in the Q&A. Near the end of the 20 or so audience questions an alarmist took the mic and proceeded to provide other stuff. He didn’t address anything specific that had been presented and asked no question. He just went on and on and on and on with other stuff. When the MC asked for a question he said, “well it’s more of a comment” then proceeded with his lecture. It was Q & A. No one invited him to give a lecture. He rudely chose to talk endlessly until cut off. And while this is going on in Oregon, plans are underway just west of Portland to start exporting coal on a huge scale to Asia. No, probably not. Temperatures of the last few years are generally going to be near the top if the long term trend is up. 62.9% of ALL of GISTemp average years are in the top 10. (100% of the first 10 years are in the top 10 – which is just about as remarkable) 14.4% of ALL years are ranked as #1 !!! (until sometime after that). Geeze — TWO highjackers working the same thread! RG and ugg. For my money, ugg is an Ugly Gross Guy in a basement with lotsa beer. Suspicion is cheap. So is betting with other people’s money. When you suspicious types demonstrate some commitment to your paranoia by staking a substantial fraction of your own standard of living on hard predictions, only then will you deserve to be taken seriously. And BTW, whether we have “higher plateaus” ahead, or a descent into the pits of a frozen hell, 9 of the 10 warmest years on record will have occurred since 1998… meaningless pablum. Yes, a measurement affects the measured thing. However many people substitute comparison with measurement, so the confusion is common. When we measure with a ruler we are actually comparing, nothing is taken from the compared thing. When we measure with a thermometer we are measuring, energy is exchanged between the thermometer and the thing. Measurement involves an exchange of energy, comparison does not. The first step in being able to control a thing is to be able to measure it, since you have figured out how to interact with it and thus affect it. The instrumentation alters albdo, air flow and laminar air flow, humidity, and air temperature. By using the same kinds of instrumentation in within comparable observation sites, it is presumed the influences of theinstrumentation upon the observed values will produce relatively similar observational results. Akvavit, vodka, and peppermint schnapps at the tailgate party introduces anthropogenic warming and anthropogenic cuddling. Irrigation projects can introduce enough water into the soils and high water tables to slightly increase nighttime low temperature averages and affect temperature trends.. Depending upon the sources of such water supplies, there may or may not be countervailing changes in the air temperatures in those locations. R. Gates, I have a problem, the earth has a slow way of responding to change with it’s large thermal inertia, the sun now has been some what despondent for quite a while, in fact some would say lazy. Of late we seem to be running out of stored heat, please explain to me in the face of the huge increase in temperature from the models, why the earth has cooled 1’C at the two metre level in a month!!!!!!! Did not have time to read all the posts so someone may have already put this out. I was at the meeting and there were lots of video taping going on. Several people, who were filming, were asked by guests to please put the meeting up on Youtube. I’m sure it will be up in a matter of days. Of late we seem to be running out of stored heat, please explain to me in the face of the huge increase in temperature from the models, why the earth has cooled 1′C at the two metre level in a month!!!!!!! I think that Mr Gates would rather that real life didn’t intrude to mess up all those lovely theories of which he’s so fond. Since greenurabngirl has not responded in any way (at least at the time I’m writing this), despite well-meaning and reasonable responses, shall we all assume that ‘she’ is one of the new breed of ‘concern’ trolls and now ignore her? That would seem best. I concur. My own favourite perspective gaining little calculation says that if you could combine the entire human population into a single organism, the result would be an organism of about half a cubic kilometer in size. As I sit here and look out of the window over the small valley of HoutBay, it would likely not even feel cramped in the space that I see. And the rest of the globe would be totally devoid of human life. Would probably be a hungry little critter, but only really like a single hungry little microbe on an elephant. Certainly helps me to keep perspective. I thought your comment was absolutely spot-on. I hope greenurbangirl stays around and isn’t put off discussion/ learning more by the more intemperate commenters. The whole article is very interesting and I learn a lot by reading this site. Thank you to Anthony and his crew. They duck like a quack! Even if, or perhaps especially if, gug is actually a girl*, it is one hugely overfed troll at the moment. Geeze — TWO highjackers working the same thread! RG and ugg gug. For my money, ugg gug is an Ugly Gross Guy Gross Ugly Guy in a basement with lotsa beer. Historically, many totalitarian regimes have used mental illness as a pretext for locking up dissidents. Obviously, anybody who disagreed with official policy and publicly stated their disagreement had something wrong with. It’s easy to limit dissent when those who speak out are locked-up and pumped full of Thorazine and similar medications. You are mistaking short-term natural fluctuations for longer-term forcing of climate. Either you are not aware of what you are doing, or you are doing so intentionally. The rather listless sun and the current La Nina are part of those short-term natural fluctuations. They will cycle back the other way in due time. The forcing from the additionally 40% CO2, and similar amounts of CH4 and N2O is not going to go away, and represents a long-term forcing that is much more potent signal upon which these shorter-term fluctuations ride. If you fail to grasp this, or refuse to, depsite numerous studies showing such, there’s not much that can be done to cure your ignorance. R. Gates, you seem equally unwilling to cast a critical eye on your own beliefs. 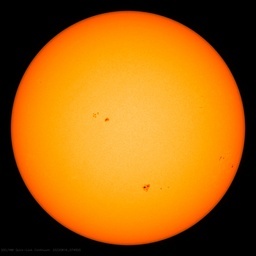 That you continue to say that the Sun is partly to blame for recent cooling means that you must yourself be unclear as to the exact mechanism of this solar-cooling connection. Yet you throw aspersions on a commentor who questions the current modeled scenarios of CO2 AGW. So do tell us what your facts and studied knowledge are regarding the solar connections. Or are you willing to question that part of the theory? If you are willing to question the solar connection, you demonstrate extreme levels of hypocritical leanings in your comment to Wayne. In other words, on the scale we’re talking about, our observation has no measurable effect on the system, and can be completely ignored with respect to “observation affecting the system”. If you’re talking about a thermometer in a small enclosed space that’s barely larger than the measuring instrument, then sure, maybe there’s some measurable effect. Not sure exactly what you mean by “question the solar connection”? Are you asking me if the sun plays a role in the short-term variability of the climate? I would answer yes to that, and through a variety of mechanism related to magnetic, EUV, and TSI effects. And I hardly am unwilling to cast a critical eye on my “beliefs” as they are always moving targets and adjusted when new data comes in that merits them being adjusted. My point to Wayne was about short-term variability versus long-term forcing. CO2 has been rising for hundreds of years, and (my current belief is) it probably started becoming a stronger signal in the climate than solar sometime in the mid to late 20th century. Numerous very detailed attribution studies show the longer-term forcing from the rise in CO2 and other greenhouse gases. If you can show me an attribution study that shows this forcing is not present, I’d love to see it. “99.9 %” would sure seem impressive if it weren’t used so often. Manufacturers of hand sanitizers claim that the sanitizers kill 99.9 percent of germs. 99(.9%?) deserve to occupy Wall Street, according to Paul Krugman. Officials were 99.9 % sure the man they got was Osama bin Laden. Oh, I’ve never been here before. I’ve never been loved like this. Never been tumblin’, stumblin’ over the words that get tangled inside of me. I’ve never been moved this way. Nobody’s ever made me say. Ninety-nine point nine per cent sure I’ve never been here before. I wish some people here would cool their ardor for “99.9%”. As for the high percentage of believers in varying degrees of AGW, this site had an interesting thread a few years back. I’m 100% sure that it was pretty revealing. “3% of Earth’s landmass is now urbanized”. Several readers commented that that’s 3% of the landmass, which is only a quarter of the earth’s total surface, meaning, I suppose, that the “urbanized” portions of the earth’s surface represent less than 1%. Mankind’s effect on the climate is negligible. Pollution is another issue. Please don’t conflate them. So many answers, so little time! First, to GreenUrbanGirl. I suspect that 99.9% of the Gentle Readers of this web site will agree with you that 99.9% of scientists agree that we DO have some effect on the environment. I hope you stick around and learn of the BUT that should have followed. Guys, be nice to GreenUrbanGirl, especially as I have characterized you as “Gentle Readers”. The Earth is so large and we are so small that our effect becomes lost in the noise. As George Carlin characterized humanity, we are nothing but a surface nuisance, something like lice. Finally, another answer to: Please explain how a weather station recording temperatures affects the system being measured. A slight amount of thermal energy is transferred between the thermometer and the media being measured, in this case air. That transfer affects the thermal energy and consequently the temperature of the air. However, in the real world it is inconsequential. See peeing in the pool, above. Aswan High Dam impacted the local climate of the Nile Valley ?”. activities world wide that would yield the same survey results. you’d get a very different set of responses. be maintained or torn down ?”, the reactions would range all over the place. meaningful if you tell the entire story behind what went into the number. Paradoxically, only 96.4% of climate scientists actually believe this figure themselves. Previously, the number was 97% – you guys need to work on keeping your story straight! Unless you’re assuming that the wall-street-journal-16 are the missing 0.1%! BTW, I would imagine that 99.9% of scientist would agree that Plankton and Green Algae have impacted the climate. In fact it hard to argue that any of the major categories of plants and animals has not had an effect on the climate — its called an ecosystem for a reason. Of course our size, individually or collectively as a species says nothing about our abililty to affect the Earth. Only a few men were responsible for the overall theories that developed atomic weapons, and a relative handful to bring about the first one. Now of course, humans could turn the planet into a nuclear winter in a matter of a few days. Those who would argue that humans are too small and puny to affect the Earth in big ways haven’t really thought through the illogical implications of their position. But of course, perhaps they don’t really care to think it through, but simply want empty rhetoric for “their” side. Great comment! I totally agree that skeptics are not organized, lack their own Greenpeace equivalent, and are all following their own pet interests and tunes. Imagine an army like that. Every running around in different directions, nothing concerted. = defeat. The hope is, though, that we get our own Greenpeace(s), which are oriented toward presenting the truth to the public, and to changing opinion. Public opinion is the key to the political aspect of the AGW war. So I think we all should start thinking about trying to feel or think or act our way toward putting together our own juggernaut skeptic Greenpeace style organization. The videos are online now. I’m new to this particular website. I have been fascinated with the AGW debate and government’s refusal, in general, to deny any debate on the science that say is settled. CO2 is now a “pollutant” regulated by the EPA. I’m sorry but I just don’t believe the government is going to save us or anything with these policies that make all of us pay more for everything. Great article. I’d love to see a real debate from both sides on this. First, these activists tend to be clustered by rather specific topics (e.g., “toxic” air emissions, water, solid waste “dumping”, animal rights, save the whales, protect American streams, protect the Great Lakes, etc.). As a result, American rivers might be perfectly willing to accept the position of the air toxics group for a reduction in “belched toxins” by 90% (even if totally infeasible technologically) because it doesn’t interfere with THEIR OWN position. The air group would probably reciprocate, as would many others. In addition, such groups and their members *often* stake out “positions” as opposed to goals or objectives as the rest of us might. They might advocate for installing some new (and perhaps not yet full-tested) air pollution control system at *all* coal-fired power plants, to *eliminate* chlorine as a potable (drinking) water disinfectant, or to eliminate so-called mixing zones across the board in setting discharge limits for sewage treatment plant permits. (Such zones have been applied for decades but there have been some cases shown to exist — as I recall — in which such zones are very small or ineffective.) As a result, even if it became painfully obvious to these folks that the technology doesn’t exist, for example, or that the cost is many times what can be accommodated by the regulated entity (e.g., more than the company’s total profit potential for the next several years combined), they can’t back off because they perceive their membership would see it as a sign of “caving in.” By staking such rigid claims and positions, they can blaming all others involved (regulatory agencies, industrial groups and individual companies, and even the taxpaying public/consumers) for not failing to achieve their stated positions, even if those positions were ludicrous. When folks on the regulated side think about these things, we bring our own circumstances and other experience and criteria to bear, such as cost implications, and case-by-case considerations of technical and economic feasibility. For example: Does the technology to achieve these limits exist? Has it been tested at full-scale or only in the laboratory? Can it be applied in this case without modification? Do we have the capital funding, as well as O&M funding, to implement these controls? Under what time frame can we get this done without incurring additional expense due to limits on equipment, appropriately trained/experienced design or construction personnel? Can we build something that will give us some buffer that will protect us from enforcement actions for non-compliance, or does the new requirement challenge event the best “bleeding edge” technology now known to exist? You may be familiar with SMART goals — Specific, Measurable, Attainable, Realistic and Timely. We are focused to think in terms of goals or objectives such as cutting some type of waste discharge by X%, by the year zzzz, where the deadline might consider the number of others who have to implement the same solution with a fixed resource base. We also look at control options, seeking to avoid sole-source solutions which tend to be over-priced and are also often in only pilot studies, not yet at demonstrated at full-scale on more than one operating facility. The forced use of specific (and expensive) technological solutions has been in vogue since soon after U.S.EPA was created. Advanced wastewater treatment technology was tested in a few *small* plants initially, then was made eligible for federal grant-funding even before EPA had a complete assessment in hand of the condition of American rivers and streams (still don;t have that). However, more than a few of those technologies were found to be hugely expensive to install and operate. Sometimes it was proprietary, patent protected. In some cases the technology was outright dangerous. One such technology I looked at years go for a municipal client went from being highly recommended for full-scale use anywhere and everywhere to being recommended as only a “polishing step,” to not recommended at all. And the last step was only embodied in a DRAFT EPA guidance document that was never finalized. In the end, we — consumers, taxpayers and businesses — just do not operate with the same logic and idealized(?) approach. Gene, ok, I can’t disagree. So I make a revision of sorts. We need a PAC — all we need is a few smart people to start, and $£ money. Once going, the plan for it would be to grow big via additional donations — both from individuals sympathetic, to pirate a warmist phrase: to “the cause” (like us ! ), and from organizations & angels. The goal won’t be like to push for clean or dirty water in any specific case, but to change public sentiment about one thing: AGW. This can be sold as important (to donaters) because sentiment on AGW has a major impact on public policy, and on elections. In the U.S., with Republicans generally anti-AGW now, a change in public sentiment on AGW will thus favor the election of conservatives, across the board. So I say ‘Greenpeace’ with a lot of latitude. So R. Gates, I take it you will not be looking into Leif’s well-researched discussion of TSI changes on temperature trends. And that is just one measure clearly examined regarding various solar variations on Earthly temperature anomalies. Don’t get me wrong, there is a mathematical calculation for the solar cycle and its mechanistic affect on temperature. But I am not talking about cycles, I am talking about long term temperature trends. TSI’s influence is buried in the noise. It cannot be extrapolated from our data sets. Not now, and not in the recorded past. That you think you can see it, or that others have told you it is there, speaks to your willingness to accept very poor research conclusions. I then must question your other beliefs about global temperature change statements.